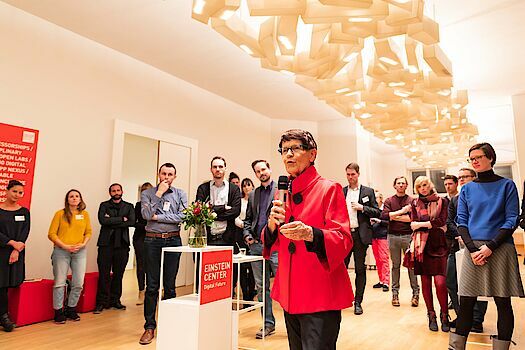 Rita Süssmuth is the new Ambassador of the Einstein Center Digital Future (ECDF). At the New Year's reception of the interdisciplinary research project, the former President of the Bundestag was officially welcomed. During her visit to the ECDF, Prof. Dr. Rita Süssmuth was impressed by the wide range of research topics relating to digitalization. "Digital transformation is a major task for our society. The ECDF brings together engineers, doctors and designers as well as urban developers and computer scientists who are facing this challenge together," she says. From 2006 to 2018, Rita Süssmuth was a member of the Kuratorium at Technische Universität Berlin. She was chair from 2010 to 2018. In this function she has already followed the establishment of the ECDF with great interest. As an ambassador for the ECDF, the renowned politician would like to accompany and support the further development of this project, which is unique in Germany. "For me, the ECDF stands for innovative and interdisciplinary research that addresses the complex challenges of the future, especially in the digital field, with creativity and a view of people and society. As ambassador I would like to support the project with my experience and to learn for myself which digital possibilities can support and relieve people," says Süssmuth. For Prof. Dr. Odej Kao, speaker of the ECDF, the new ambassador is a great enrichment. "It is a great acknowledgement for the ECDF that Prof. Süssmuth is devoting her valuable time and energy to the further development of the ECDF. I was impressed by her exciting questions, her perspective and her ideas on how to shape the digital transformation. Rita Süssmuth's wealth of experience and vision will benefit both our professors and the initiative as a whole," he says.